You may also find the About section worth browsing. It contains links to a number of interesting external sites, including spoken Cherokee samples and Amazing Grace sung in Cherokee. Your comments are always welcome. We send a special greeting to the Rabun County [GA] Historical Society. They seem to have one of the best organized county historical websites in the old Cherokee country. To make the content of this blog more widely available, the materials in it have been reorganized, extended, and provided with more illustrations and maps to create a Kindle version, which can be read on any tablet or computer with an installed Kindle reader. The e-book has a table of contents with hyperlinks to the chapters and a list of illustrations, also with links. There are a few internal links for cross-references, and there are external links for additional reading and research. There is an extensive index, but the items in the index do not have links because many items occur in more than one place. Searching from the index can be done with the normal Kindle or other reader’s search function. The illustrations are in full color when a color-enabled e-reader is used. The book, now in its second expanded and enlarged edition [as of 23 February 2013], can be found at this link on Amazon. It is speech-enabled, and I am impressed with how much that technology has advanced. The voices are no longer robot-like and they generally pronounce English words and sentences quite well. However, the pronunciation of Cherokee words is less than perfect, as would be expected. [Note that the Eastern Cherokee Treaty Signers pages are not included in the book.] [The price has been set at $2.99.] Thank you for your interest in Cherokee Place Names. There are eight Cherokee counties in the United States. Seven of them have historical connections with the Cherokee people. As found in hundreds or thousands of business names, personal names, automobile models, and much more, the name “Cherokee” is greatly overused, more or less indiscriminately. If it were possible for them to collect royalties on such usage, the three recognized Cherokee tribes would together be one of the wealthiest entities on the planet. The Cherokee are probably the best-known worldwide of all American Indian tribes. I am going to refrain–wisely, I think–from commenting on the enormous number of Americans who insist that they have Cherokee ancestors. And, I will have nothing to say here about the 212 groups, at last count, who declare that they are unrecognized Cherokee tribes and remnants. In modern Cherokee, the word is Tsalagi. In the now extinct Lower Cherokee dialect, it was Tsaragi, and it was from this dialect that the name was anglicized to “Cherokee.” Although Tsalagi is not a Cherokee word, it is now the self-designation of the members of the tribes. Its origin is uncertain, but I am inclined to agree with those who believe it may have come from Choctaw, probably from a term meaning either “people who live in the mountains” or “people who live in cave country.” Here are those eight counties, alphabetically by state name, with a brief explanation of how each one acquired its name. Cherokee County, Alabama, was formed from Cherokee lands soon after the Treaty of New Echota was signed, more than two years before the Trail of Tears. Cherokee County, Georgia. Originally, most of northwest Georgia, which then belonged to the Cherokee, was simply designated late in 1831 as that state’s Cherokee County. 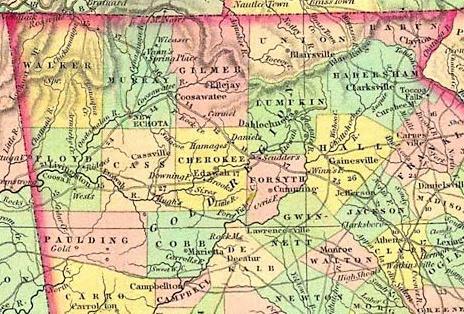 Within a year, it was carved into nine new counties, and, toward the end of 1832, the Cherokee lands were distributed by lottery to white people. Some of the Cherokee were already being forcibly removed by Georgia in 1831, years before the falsely promulgated Treaty of New Echota. The remnant after the other nine counties were created—and a part of it used to form Milton County in 1857—is the present Cherokee County. To be historically blunt, the State of Georgia was the most brutal of all states toward the Cherokee. 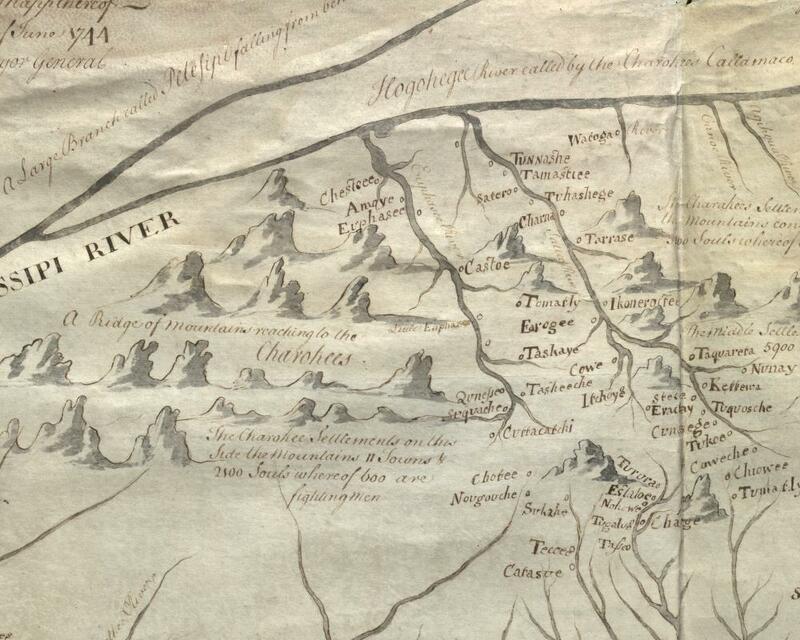 Here are maps of the Cherokee lands in Georgia in 1822 and in 1834. Cherokee County, Iowa, lies in the northwestern part of the state. It was one of many formed from “Indian Treaty Lands” in 1851. The name seems to have been chosen because the Cherokee had no connection at all with the area. More details about the historic and prehistoric Indians of Iowa can be found in the Wikipedia article Indians of Iowa. Cherokee County, Kansas, is the extreme southeastern county of Kansas, bordering Craig County, Oklahoma. Craig County was formed from a part of the Cherokee Nation when the Indian Territory became a state in 1907. Some Cherokee people lived in that part of Kansas beginning in the 1830’s. Cherokee County, Oklahoma, is at the heart of the Western Cherokee country, formed from a part of the Cherokee Indian Nation, Indian Territory, shortly before Oklahoma became a state. The county seat, Tahlequah, is the capital of the Western Cherokee Nation today. A little more than one-third of the population of the county are American Indians. Cherokee County, South Carolina. There were some Cherokee [and Catawba and other Indians] using the lands in this area when the white people moved in and pushed them away beginning in the middle of the 18th Century. Cherokee County, Texas, adjoins the northeastern line of Houston County. It has a complex and sad history of Cherokee settlers and their unfulfilled hopes. You can find more details of that history here. Google Earth reveals a remarkable and prominently visible valley, some 150 miles long, almost unnaturally straight, only three to five miles wide, extending from west of Knoxville southwestward to Blount County, Alabama. The part in Tennessee is called the Sequatchie Valley; the Alabama portion is known as Brown’s Valley. The satellite photo here is one made by NASA. The Sequatchie River originates in southern Cumberland County, Tennessee, and meanders from side to side within the valley for a good part of the valley’s length, until it empties into the Tennessee River just west of Chattanooga. Were the river stretched out straight, it would likely extend for well over 200 miles, but, because of its tortuosities, it traverses not quite the entire Valley within Tennessee and none at all in Alabama, of course. Officially, it is reported to be 116 miles long, but even that figure incorporates most of the major meanders in its determination. Before the Valley had been studied more authoritatively, it was believed to be a rift valley, which would have made it all the more remarkable. Geologists have long since determined that it is actually an eroded anticline. Either case would have explained the sometimes very steep escarpments on either side of the Valley. As so often happens with other errors in every field, the designation as a rift valley [“one of only two on the planet”] has been copied into succeeding works and is still found in many references today. Our interest lies in the word Sequatchie. How came the Valley and the River to have this name? And, therein we find other problems. Chambers of commerce and historical sites in the region say the Valley was named for the Cherokee “chief” Sequachee or Sequatchie, who “signed the Turkeytown Treaty” of 1817, or who “signed a treaty with colonial South Carolina.” I have found no such signer for any treaty involving the Cherokee. If he signed any treaty, it must have been a very obscure one; however, I am continuing the research, and I will report the error if I am wrong. Personally, I doubt that there was ever a “Chief Sequachee” who signed any treaty. If I prove to be wrong, I will own up to it. In the 1835 Henderson Roll, the last census of the Cherokee in the East before the Trail of Tears, there does appear one Sequahchee, who lived in Georgia. He had no traceable connection with the Valley, and I feel quite sure that it was not named for him or his family. He probably was removed to Oklahoma during the Trail of Tears. Let’s see if I can assemble what I have learned from some intensive research into a plausible whole. The following is much more speculative than is my usual practice, and it is subject to argument and correction if later research proves it highly unlikely. The Knoxville area was first settled by whites in the 1780s. Cherokee people living there knew about the old village of Sigwetsi, and perhaps some of it even remained intact. I suspect that the town did not come into being until after the Spanish explorers passed through. I will explain that reasoning shortly. From the vicinity of old Sigwetsi, a trail developed to the west through what is now Kingston to the head of Sequatchie Valley. The route came to be called informally “the Sequatchie road.” English speakers spelled it more or less that way in letters and documents, some written in the early 1800s. Because the Sequatchie road led to the Valley, it was only natural for the Valley to become the Sequatchie Valley. I can’t prove all of this, but there are enough indications from old letters and documents to provide some support for my conclusions. Now, having settled that, let us see what the meaning of Sigwetsi was likely to have been. The Cherokee had never seen hogs before the Spanish explorers came, so they used the word for opossum (si’qua) as a name for them. That left them with the necessity to distinguish ‘possums from pigs, so the ‘possum came to be called “siqua utsetsidi,” the “grinning pig,” a short form of which is “siqua-utsets.” Nowadays, only the grin is left, and the possum is just “utsetsidi” [pronounced roughly “oo-chets’-dee,” depending on the dialect]. Sigwetsi is merely a shortened form of “siqua utsetsidi.” Such shortenings are common in Cherokee. The shortened form would have been accented on the –qua- element, becoming roughly “siQUAchets.” And that became Sequatchie in the white man’s pronunciation. Sigwetsi, then, was Mooney’s best approximation of the name of the settlement, and the village name is likely to have meant “Opossum Place” to the Cherokee who lived there. That’s ” ‘Possum Town” to you and me. You may be sure that my research into the origin of Sequatchie will continue. From 1721 through 1868, the Cherokee people had more than forty treaties with the white people, at first with the British and colonists and later with the American government. So far as I can tell, all of them seem to have been broken. One that is of interest to us here in dealing with place names of Cherokee origin is the Treaty of 1817, also called the Treaty of the Cherokee Agency. There had been, in 1816, two other treaties which, as usual, required the Cherokee to cede more lands. In March of that year, they had ceded all remaining lands in South Carolina, a small section in and around what is now Oconee County. In September, the tribe in a general meeting at Turkeytown [Alabama] had ratified the Treaty of the Chickasaw Council House, ceding most of their lands in Alabama and nearby border areas, some 3,500 square miles. On 8 July 1817, the Treaty of the Cherokee Agency was signed by 31 Cherokee leaders from North Carolina, Tennessee, Georgia, and Alabama, and by 15 Arkansas Cherokee chiefs, as well as by Major General Andrew Jackson—he did not become President until 1829—and by Governor McMinn of Tennessee. It is often somewhat erroneously called the Turkeytown Treaty. Including the Arkansas chiefs constituted the first formal recognition of the Western Cherokee. Most of the Cherokee bitterly opposed this treaty and that of 1819. 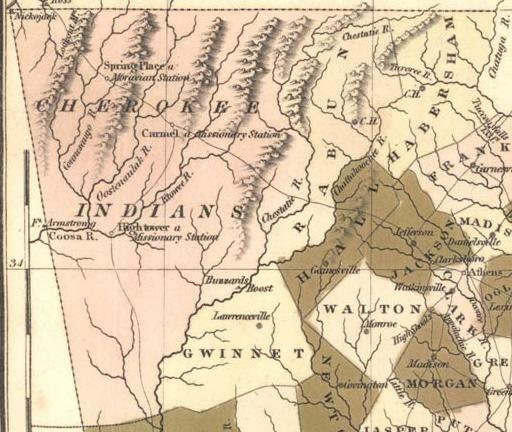 Together with the Treaty of Washington in 1819, the Cherokee Nation ceded almost all their remaining lands in the East, except for northwest Georgia and some adjacent lands in Tennessee, Alabama, and the extreme western part of North Carolina. The details of the cessions can be found in the map at this link. The treaty promised a square mile of land to every Indian family east of the Mississippi River living on the lands that were ceded to the government if they would become citizens of the United States and give up their status as Cherokee [or other] Indians. Six hundred forty acres for their very own, with their present home as nearly as possible to the center of that acreage–that was the promise. All they had to do was file a request with the Indian Agent within almost a year. Very few of the people had ever owned any land, and the concept was somewhat foreign to them. Perhaps the main attraction for becoming “citizen Indians” may have been staying in the East, on familiar lands. Only about 311 Cherokee people applied for the land. A few of those actually got some land, usually less than the promised amount, and almost all of them lost what they did get. Still, for a time, some of them remained among the white settlers. Without going into historical details about the frustrations and thwarting of the allotments, we can see what effects some of these citizen Cherokees had on local place names. [If you would like to examine some of the efforts by the states to deprive the Cherokee of the promised allotments, you could read the efforts of the state of Tennessee, which were probably typical of most of the states involved, possibly excepting North Carolina. Georgians were especially inimical to the Cherokee, as later events would prove.] You can find more depth on Cherokee history at this link. Cherokee people who applied included The Cat, who lived near Sugartown [Cullasaja]. The creek he lived on is now called Cat Creek. His name was probably a translation of Gvhe, wildcat, or it may have been a translation of Tlvdatsi, the mountain lion, which the white settlers called “painter” [panther”]. Wesa was merely a Cherokee attempt at the English word “Puss,” the word used for a domestic cat. Near Betty’s Creek is Betty Whitecloud Street. As of now, I do not know if there is any connection with Little Betty, and I am inclined to doubt that there is. Another applicant was Old Mouse, who lived “below Cowee,” that is, downstream from Cowee [NC]. He is remembered in the names of Old Mouse Creek and Mouse Mountain. His name is a translation of the Cherokee word talasgewi [or possibly tsisdetsi or tsistetsi], with “Old” having apparently been appended in English. The reservee listed in application documents as Musk Rat was living on Cartoogechaye Creek [on Ca-tur-as-joy Creek, the document says]. Muskrat Creek, Muskrat Valley, and Muskrat Road are named for him. His English name was a translation of salaquisgi [or salagisgi or selagisgi]. Otter Creek, about halfway between Franklin and Robbinsville, in the Nantahala Community, takes its name from citizen Cherokee Otter. His name is a translation of Tsiyu. His neighbor to the northwest was one Taylor Eldridge, white husband of Pathkiller’s daughter Ailcey. Pathkiller himself had applied for his reserve about 2½ miles above the mouth of Sweetwater Creek, further to the northwest in the same general area. Otter’s daughter Jane, while working for some of the white settlers, is said to have been killed by a panther [tlvdatsi, mountain lion]. Her name was given to Jane Otter Creek, a tributary of Otter Creek. 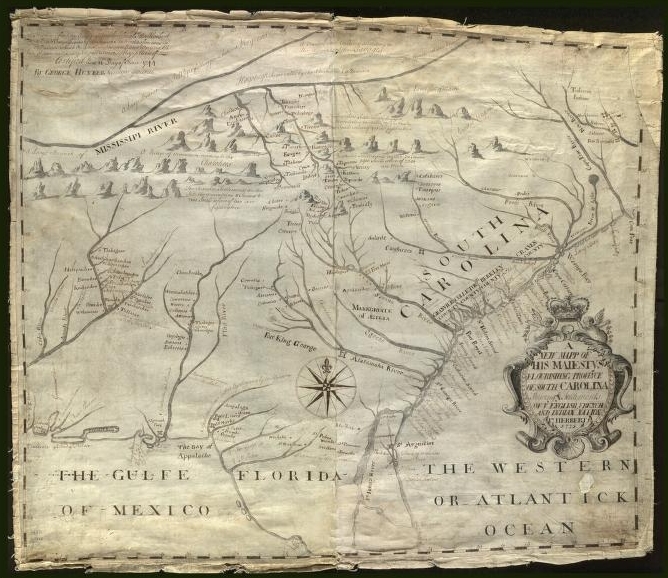 In 1818, Eu-chu-lah of Cowee applied for his 640-acre reserve just west of the Cowee Mound, and it seems to have been granted. In old documents, it is recorded as the Euchella Farm. It seems to have been taken over by the state of North Carolina almost immediately, whether by sale or by force. In 1821, 299 acres of it was sold by the state to Joseph Welch. The name survives in Euchella Cove, Euchella Church, and some other modern developments some miles to the west of the original farm. For more than forty years, whenever I have had occasion to be in the area, I have lingered for a time at the Old Stone Church Cemetery in Clemson, South Carolina. For a few years in the 1970’s, I lived not many miles away. I last visited the cemetery in 2011. As you can see, the marker does not appear to be ancient. Of course, it may have been merely a home-made replacement for an earlier, vanished stone, made by some person of good will. I do not know who made it or how it got there. But, it was a replacement for an earlier marker. The catch is that Osenappa was very probably not a Cherokee Indian. The Cherokee language does not have any [p] sound at all; it is not a Cherokee name. My mildly educated guess is that the word is from one of the Muskogean languages, most likely Choctaw. 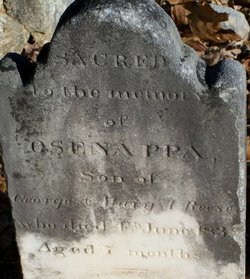 Osenappa Reese was the son of George Reese II, and, so far as we know, he was born late in 1829 and died on 4 June 1930 of diphtheria. He was named for the Indian Osenappa. In the cemetery is buried Rev. Thomas Reese, pastor of the church from 1792 until his death in 1796. He is said to have been the first, or among the first people buried in the cemetery. 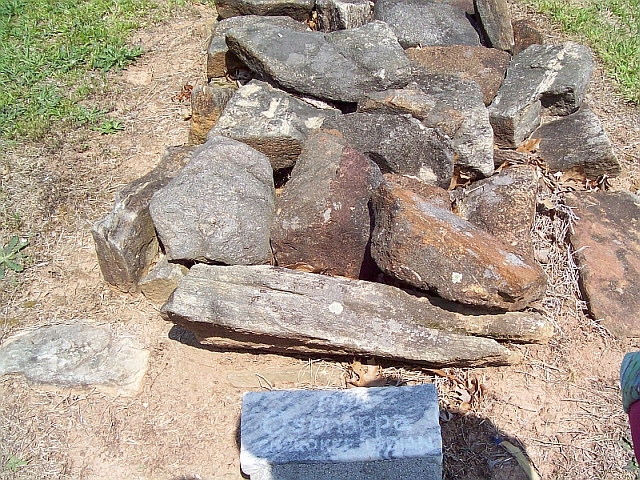 Nearby is the grave of his brother George Reese, the grandfather of Osenappa Reese. Did the Indian Osenappa befriend the white settlers in the Pendleton District? Where did he come from, if he was not a Cherokee? Was there an Alabama connection? A few miles to the south of West Point, on the Georgia-Alabama line, Osanippa Creek empties into the Chattahoochee River [or, rather, into the upper reaches of Lake Harding, formed by a dam on the Chattahoochee]. A coincidence of names? Perhaps. Perhaps not. In older documents from the 19th Century, several of them, the creek’s name appears as Osenappa. Is it the same name? Is there a direct connection? The creek’s name seems to have come from a Muskogean word meaning “moss up high,” perhaps indicating its banks were moss-covered, or it may simply have referred to a tree with a high moss cover. Curiously, George and Mary Ann Reese, the parents of Osenappa Reese, celebrated their golden wedding anniversary in 1874 at the home of their son Milton E. Reese in West Point, Georgia. Their last residence was Bluffton (now called Lanett), in Chambers County, Alabama. Connestee Falls, NC, takes its name from the lost city of Kanasta. Here is the legend, taken more or less directly from Mooney’s Myths of the Cherokee. Long ago, while people still lived in the old town of Kana’sta, on the French Broad, two strangers, who looked in no way different from other Cherokee, came into the settlement one day and made their way into the chief’s house. After the first greetings were over the chief asked them from what town they had come, thinking them from one of the western settlements, but they said, “We are of your people and our town is close at hand, but you have never seen it. Here you have wars and sickness, with enemies on every side, and after a while a stronger enemy will come to take your country from you, We are always happy, and we have come to invite you to live with us in our town over there,” and they pointed toward Tsuwa`tel’da [Pilot Mountain, in western Brevard County, North Carolina; altitude 5151 feet]. “We do not live forever, and do not always find game when we go for it, for the game belongs to Tsul`kalu’, who lives in Tsunegun’yi, but we have peace always and need not think of danger. We go now, but if your people will live with us let them fast seven days, and we shall come then to take them.” Then they went away toward the west. The chief called his people together into the townhouse and they held a council over the matter and decided at last to go with the strangers. They got all their property ready for moving, and then went again into the townhouse and began their fast. They fasted six days, and on the morning of the seventh, before yet the sun was high, they saw a great company coming along the trail from the west, led by the two men who had stopped with the chief. They seemed just like Cherokee from another settlement, and after a friendly meeting they took up a part of the goods to be carried, and the two parties started back together for Tsuwa`tel’da. There was one man from another town visiting at Kana’sta, and he went along with the rest. When they came to the mountain, the two guides led the way into a cave, which opened out like a great door in the side of the rock. Inside they found an open country and a town, with houses ranged in two long rows from east to west. The mountain people lived in the houses on the south side, and they had made ready the other houses for the new comers, but even after all the people of Kana’sta, with their children and belongings, had moved in, there were still a large number of houses waiting ready for the next who might come. The mountain people told them that there was another town, of a different people, above them in the same mountain, and still farther above, at the very top, lived the Ani’-Hyun’tikwala’ski (the Thunders). Now all the people of Kana’sta were settled in their new homes, but the man who had only been visiting with them wanted to go back to his own friends. Some of the mountain people wanted to prevent this, but the chief said, “No; let him go if he will, and when he tells his friends they may want to come, too. There is plenty of room for all.” Then he said to the man, “Go back and tell your friends that if they want to come and live with us and be always happy, there is a place here ready and waiting for them. Others of us live in Datsu’nalasgun’yi [see Track Rock] and in the high mountains all around, and if they would rather go to any of them it is all the same. We see you wherever you go and are with you in all your dances, but you can not see us unless you fast. If you want to see us, fast four days, and we will come and talk with you; and then if you want to live with us, fast again seven days, and we will come and take you.” Then the chief led the man through the cave to the outside of the mountain and left him there, but when the man looked back he saw no cave, but only the solid rock. The people of the lost settlement were never seen again, and they are still living in Tsuwa`tel’da. Strange things happen there, so that the Cherokee know the mountain is haunted and do not like to go near it. Only a few years ago a party of hunters camped there, and as they sat around their fire at supper time they talked of the story and made rough jokes about the people of old Kana’sta. That night they were aroused from sleep by a noise as of stones thrown at them from among the trees, but when they searched they could find nobody, and were so frightened that they gathered up their guns and pouches and left the place.